Introducing the Sphero Bolt, which is a robot that has a programmable LED display and infrared sensors. Designed by Sphero, the Sphero Bolt follows the company's ethos of having a commitment to education-based products, but it comes with some upgrades that give it more capabilities than the original Sphero and Sphero Spark+. The biggest and most noticeable difference with the Sphero Bolt is that it comes with an animated and programmable 8 x 8 LED screen so it can show a winking smiling face when a task has been completed or an arrow for the direction it’s moving in. The Bolt also sports four infrared sensors, meaning there is an opportunity for these little robots to communicate with each other. This is the first time Sphero has created the ability for multiple robots to interact, and the company says that up to five Bolts can speak to each other within a radius of about five meters. Also new to the Sphero Bolt is a built-in compass that gives it better aim, an ambient light sensor, and a better battery for up to two hours of heavy use play time (perhaps longer if performing simpler moves) before needing to be recharged. Sphero's ball robots can be controlled via the company's mobile app and are meant to be a tool to teach kids about robotics and computer programming. There are actually two apps: the Sphero Play app for scooting the ball around by interacting with your device's touchscreen and the Sphero Edu app that lets users stack blocks of code to program how the robot behaves via its gyroscope, accelerometer, magnetic compass, light sensor, and more. The Bolt also works with Apple’s Swift Playgrounds program, hooking it into Apple’s educational ecosystem. You’re welcome to 'just have fun', through the Sphero Arcade app, too. 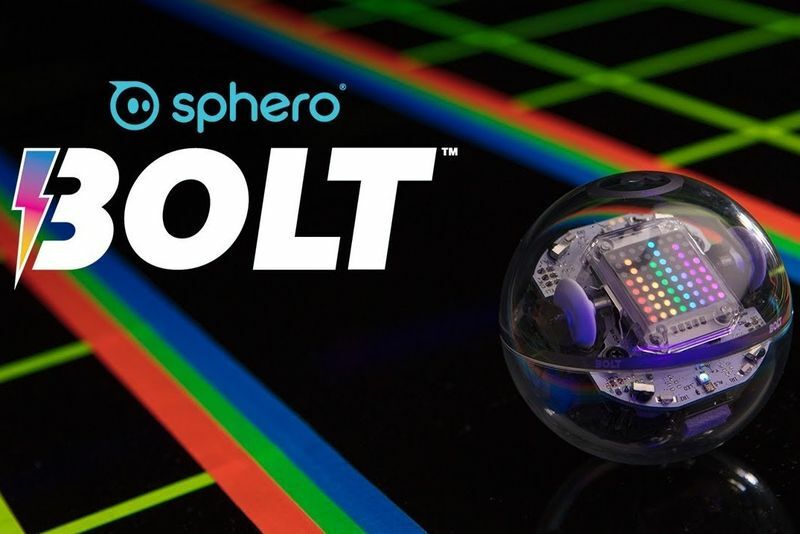 The Sphero Bolt is available now for $149.99 via the company’s website, and it will be at select retailers later this month. Check out the programmable robot, in action, below.